Staying consistent with your health routine while traveling is definitely a challenge. Often times, we choose to forego the exercising and healthy eating in order to indulge in the authentic local food and laze around at the beach with a cocktail in hand. You might not have access to a gym like you do at home, or might not have access to a kitchen to make all your food, but that shouldn’t stop you. Whether you are traveling for work or are off on your next vacation, here are 8 tips to stay in shape while traveling. Just because you are on vacation doesn’t mean you can forget about your health. Yes, you should enjoy yourself but don’t throw all the hard work out the window. Be willing to be flexible with your workouts and food while away. 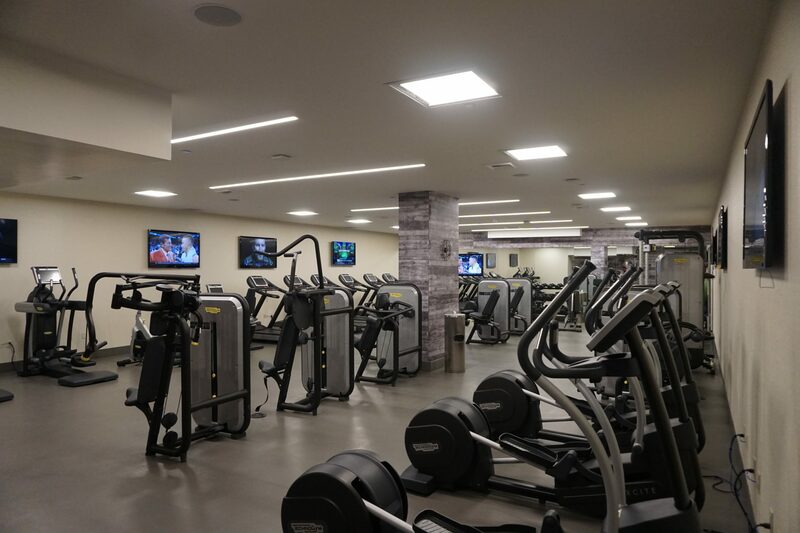 Staying in shape while traveling requires a little more flexibility around your schedule. However, make sure you plan for a couple days of exercising, otherwise it won’t happen. If you know some days are less busy than others, plan to start with a short workout in the morning. You don’t have to have a bunch of exercise equipment to have a great workout. We bring a few small things, like to bring a small resistance band and a jump rope with us, that way we can still get some workouts in without adding too much weight to our bags. Even without any equipment, bodyweight workouts are great because you can do them anywhere and they can be pretty quick. It helps if you can exercise with a nice view! Here’s a quick and easy bodyweight workout that we like to do when we are traveling. You can do it for reps or for time-whatever works better for your time schedule. working out with a view! READ 5 Reasons to Travel NOW! It is easy to want to jump on the bus to sightsee but why not walk or bike to different sights? It’s a great way to get our exercise is. Take the stairs when given the option. Choose to go on a hike – it’s the perfect way to get some exercise while enjoying the scenery. 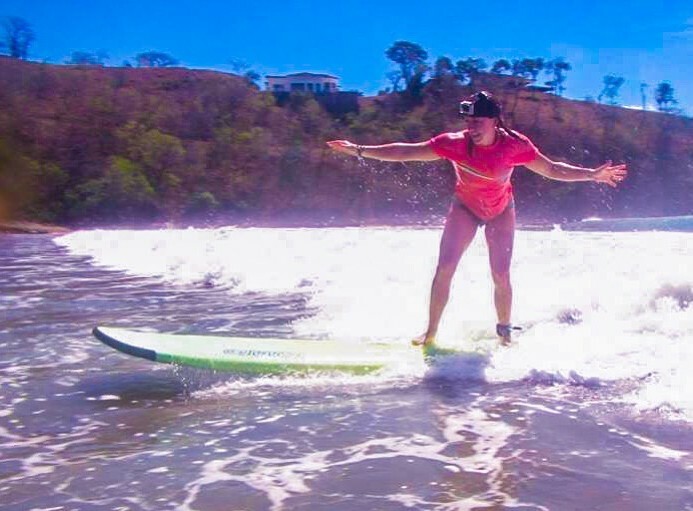 Water sports like swimming, paddle boarding, and surfing are all fun activities that will keep you moving. Food is key! It is easy to overindulge while vacationing. Always eat breakfast especially if you have a busy day. Focus on primarily protein and veggies. Be SMART with the desserts. We definitely aren’t saying skip all desserts, especially because I enjoy my sweets, but enjoy the food without going overboard. You really don’t need dessert every night! Alcohol is great, but it can definitely help you pack on the pounds quickly. Just think most of the time the sweeter the drink, the higher the calories. Wine and liquor (without the extra sweeteners) are the best option if you are choosing to drink. Stock up on healthy snacks like nuts, protein bars, and fruits. Bring them with you from home or stop at the store and load up. These are great for long days of travel or when you’re rushing from one meeting to the next. Just because you may not have to wake up and go to work early doesn’t mean that your body doesn’t need sleep. Sleep is the #1 trick to staying healthy whether at home or on the road. Sleep is the precursor to recovery and fat loss, so if you’re not getting enough sleep it will be much harder to lose weight. It is important to keep a regular schedule even while traveling. Traveling in itself can tend to dehydrate you, so no matter where you are it is important to keep yourself hydrated. Also helps your immune system! Every trip we go on we make sure to take our hydroflask with us, as we have found it’s much easier to get all our water intake in throughout the day. Did you know you should drink half your bodyweight in ounces A DAY? Better go get that water bottle! 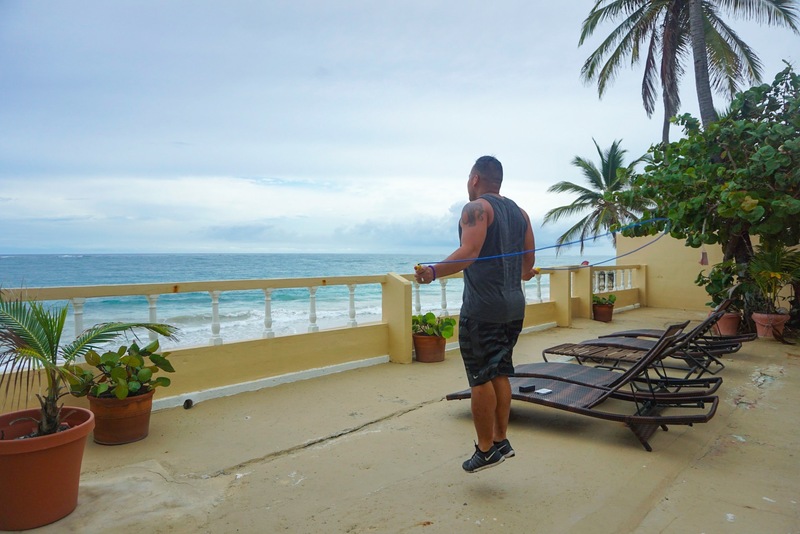 Vacation is a way to try the local food and enjoy the scenery but that doesn’t mean we slack on our fitness. We just find different ways to be active than we do at home. As personal trainers it is important for us to practice what we preach but in a more relaxed way than if we aren’t traveling. Just because we are traveling doesn’t mean we forget about our health. It is important to prioritize our health and fitness goals even during this time. It doesn’t need to be the only thing you think about while on vacation but it shouldn’t be forgotten. No matter if you are at home or on the road dedication and consistency are key to anyone’s fitness goals! 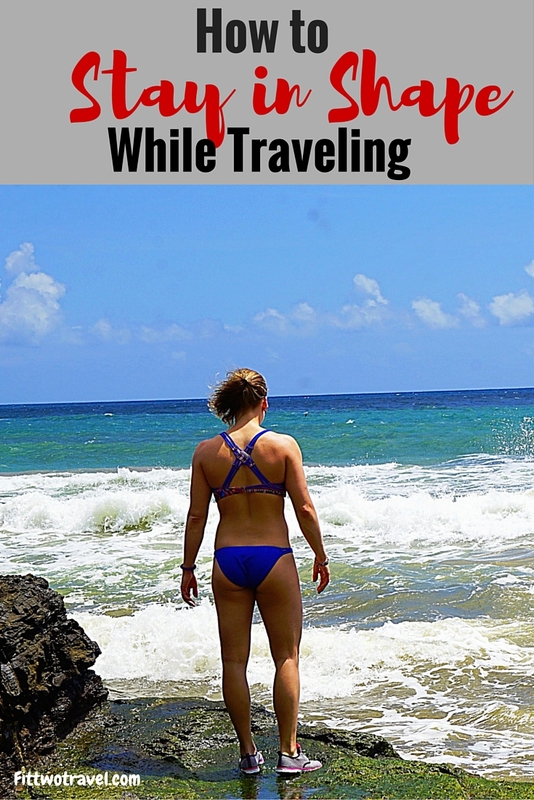 How do you stay in shape while traveling? We’d love to hear different ways you stay healthy while away from home! Leave us a comment with your ideas and please share this with your friends to pass on these tips! Wow. Thanks for this Tips. I find that I actually am way more in shape when I travel even though I never hit the gym or go on runs. I walk everywhere and make sure to be active (eg hiking, bike tours, swimming on beach vacations). Traveling is the best way to be in shape for people like me who just can’t ever find the motivation to go to the gym or build up a consistent exercise regimen! such a great post. Its vey helpful since I keep eating a lot while I am traveling!!! You guys look great! I need to take you up on these tips! I am really good about drinking water at home, but when I am out and about traveling not so much. I should carry a water bottle but I always feel like I have so much other stuff…..I guess I just need to make it more of a priority. Great! Food is #1 imho, exercise seems to just make me hungrier! We are actually more active on vacation! Away from work stress and sitting all day, while on vacation we hike, swim, and explore. Other than cruise ship vacations, we usually come back at least a few pounds lighter! Cathy recently posted…Is Pokémon Go the Newest Outdoor Adventure? Uhhhhh but drinking all my calories is my favorite! Def good info! Something I always struggle with. Aww man, I fail at pretty much ever aspect of this list. I definitely don’t sleep, Eat like a horse, and definitely have no plan. Luckily I stay active with hikes and exploring, and I don’t drink much since I’m usually too tired at the end of the day to even think about it 🙂 Great tips, if I slow down, I’ll try to follow them! Thanks for the article! I like to do workout videos that don’t require any equipment. My hotel rooms usually have enough space to do them and I don’t have to worry about the hotel gym having proper equipment. I’ve even used water bottles are make shift hand weights.